LPG-Air (SNG) mixers blend vaporized LPG with air to achieve a mixture suitable for use in natural gas appliances. When used for natural gas replacement, LPG-air mixers must blend the gases at a rate equal to the appliance rate of consumption, and at a quality such that end-use equipment performs equally well under either gas. Several methods exist to achieve LPG + Air blending. Standby has been instrumental in much of their development. Today two very different methods dominate mixer design, the venturi mixer and the parallel-pipe mixer. 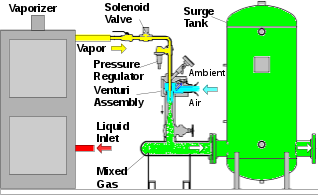 Venturi style mixing systems use high-pressure LPG vapor to entrain air directly from the atmosphere by venturi action. The high-pressure vapor is expanded through a nozzle into the throat of a venturi tube causing air to be entrained, mixed and then recompressed in a diffuser section. A “surge” (volume) tank is added at the discharge to prevent undesirable short cycling in operation. Venturi mixers are batch style mixers, cycling on and off to maintain discharge pressure within a narrow operating band. They are the mixer of choice for blended gas pressures less than about 15 psig (1 barg) since they do not require a compressed air source. Also, they are considered to have infinite "turndown" due to their on-off nature of operation, and are therefore suitable for highly variable gas consumption profiles. In most cases multiple mixing tubes are staged, to accommodate larger loads. Many natural gas end-users utilizing LPG as a back-up fuel prefer venturi style mixers due to their simple operation and repeatable performance. They have also been used by utilities on low-pressure natural gas distribution systems. Furthering their reach is the addition of a compressed air package that allows operation at pressures greater than 15 psig (1 barg). Parallel pipe mixers, such as Standby’s MFC mass flow mixer, blend the two gases at the same rate at which gas is being consumed. 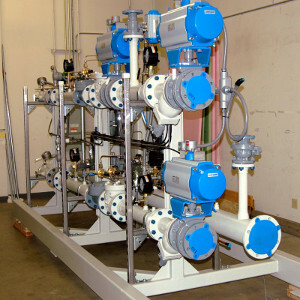 Automated valves control the flow of each gas to achieve the goals of maintaining pressure (alternatively energy flow rate), and maintaining gas quality. Generally used by gas utilities in peak shaving operations and by large end-users, parallel pipe mixers offer certain advantages over other mixer types. Standby Systems’ type MFC parallel pipe mixer is a sophisticated mixer incorporating multiple blending modes. It is used to maintain system pressure or energy flow rate, while maintaining a constant final mixture Wobbe Index. Normally the energy flow of LPG is measured, the mass flow of air required is computed based on design criteria, and airflow is adjusted so as to meet this requirement. When used in peak shaving to supplement natural gas energy flows, the amount of natural gas flowing is also evaluated as this impacts gas quality and final mixture specific gravity. MFC style mixers require a compressed air source and are generally used in pressure applications greater than 15 psig (1 barg) with high flow capacity requirements and the need for greater control capabilities than can be obtained with other styles of mixers.